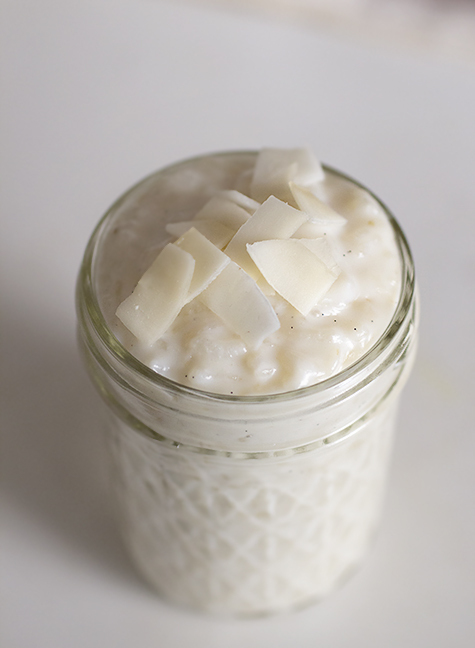 I made this coconut rice pudding planning to eat it cold. I was warned about the heat before I moved east for the summer, but growing up in the Pacific Northwest left me helpless. I thought it’d be a little warmer than Seattle, where July is sunny with a breeze. I figured I should probably pack a tank top or two. I found out summers in New York laugh at summers in Seattle. It’s hot here, but then again, it’s hot everywhere. I’m not used to this kind of weather, where the heat firms up against your shoulders like wax, and the humidity settles heavy as wool. My apartment is a fourth floor walk-up, which means I always come home out of breath and embarrassingly sweaty. We haven’t figured out how to install the AC yet. Last weekend, I woke up before the heat crept in. I knew it wouldn’t last long, though, so I decided to cook while I could. I poked around my cabinets and found a can of coconut milk. I’m surprised by how many people don’t like coconut. I’ve always loved the stuff—so smooth, sweet, and rich. I admire its versatility, delicious whether stirred into curry or scooped straight from the husk, and the smell of toasting coconut is one of my all-time favorites. 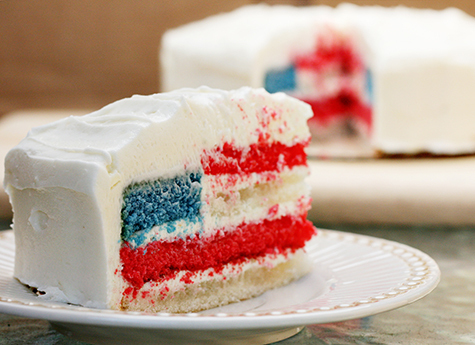 I especially like it in desserts. Usually, when it’s not too overpowering, the coconut adds an elusive balminess. 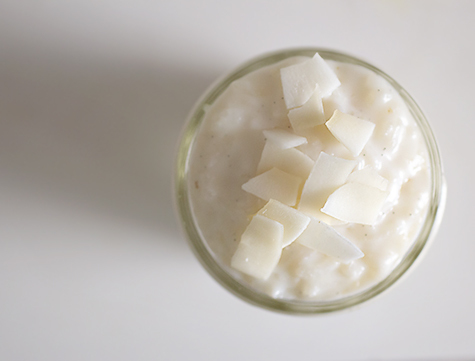 It shouldn’t taste like sunscreen, but add a special oomph. 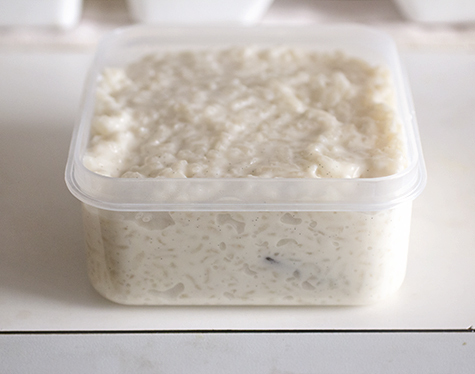 I also found some white rice, leftovers from a Chinese take-out night, and that’s when I decided to transform the two into coconut rice pudding. I whipped this batch up in thirty minutes flat. But I wasn’t fast enough. As the milk simmered and the rice grew fat with coconut and sugar, the temperature rose in that little kitchen. It was scorching by the time the pudding was thick enough to give a spoon trouble. I thought I’d let it chill completely and eat some after lunch, but ultimately I couldn’t resist a taste. 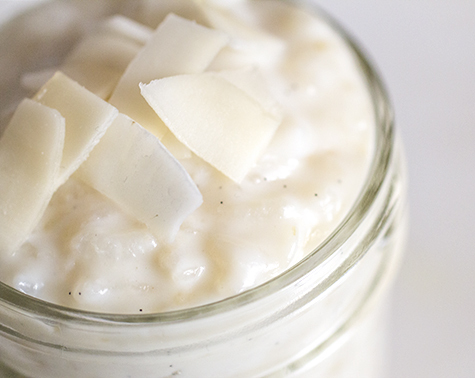 Wholesome, comforting, creamy, decadent. The coconut was mild—-maybe not even strong enough for a coconut fanatic-—but gorgeously buttery. It was sweet, but not sugary, and luxurious enough to make me feel guilty. In the end, I ate a piping hot bowl right then and there for breakfast. And that night, I tried a spoonful cold, and it was respectable. But this dessert comes alive when it’s warm. All the flavors breathe, the pudding melts into utter goodness, and your belly heats up like you might boil over with happiness, even if it couldn’t get hotter outside. Maybe it’s time to install that AC. I bought a carton of strawberries. I did it against my better judgment—the berries were suspiciously big and still a little out of season, not to mention overpriced. They were so red I couldn’t help but feel suspicious. But I bought them anyway because I wanted to make panna cotta, and I thought berries would make the plate prettier. Plus, I’d found a half-cup of cheap cabernet in the fridge, forgotten by the apartment’s previous tenants, and I figured that would be enough to make mediocre berries taste good. I went home and got to work, chilling the panna cottas and reducing the wine to a slow-bubbling glaze. After all that, I popped open the box of strawberries. I was surprised—they actually looked really good. Well, I thought, I’m glad they’ll photograph nice. I scooped up a handful, ran them under water, and let them tumble onto a cutting board, which slowly pinkened with juice. 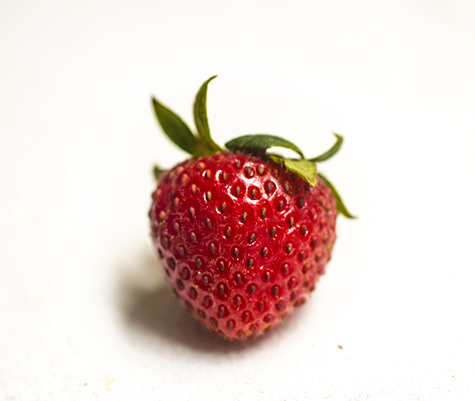 Before slicing, I picked up one of the smaller berries, pinched off the green, and popped the whole thing in my mouth. With one bite I was transported home to Seattle, to our front yard, to my mom’s strawberry patch. She planted the seeds when I was a senior in high school. They’ve grown prolifically since then, the leaves a dense carpet. 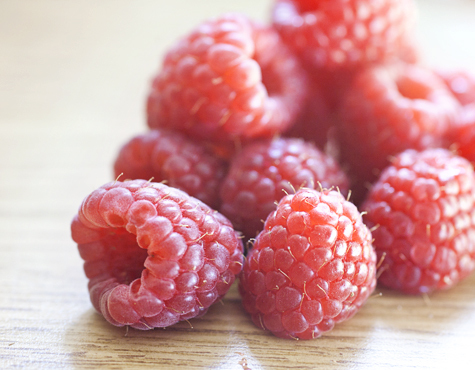 The berries are tiny, thimble-sized, and redder than roses. They’re profusely floral, like perfume in your palms, so fragrant you taste them before you’ve parted your lips. Each bite melts on your tongue and the sweetness probably causes cavities. They’re the best strawberries I’ve ever had. One year, I infused some into a jar of bourbon. Another time, I made shortcakes with thick dollops of real cream. But they’re always best as-is, still warm from the sun, by the bowl-full. My dad likes to dip them in black pepper, a preference I found off-putting until I tried it. You can’t actually taste the pepper—like salt on chocolate, it simply enhances the berry itself. 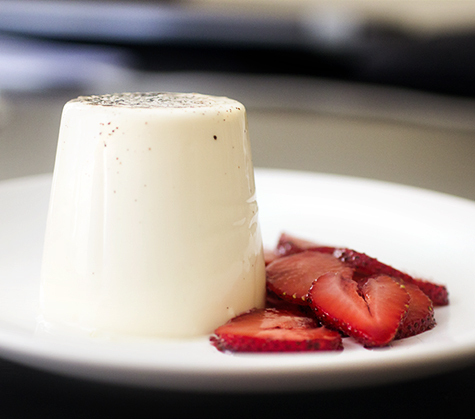 Once I’d settled on red wine strawberries, I added pepper to the panna cottas, without hesitation. The grocery store strawberries weren’t as good as my mom’s. Not even close. But they were outrageously better than I expected. The panna cottas were, too. I was nervous they would stick to their molds, but each panna cotta wobbled right onto the plate. The texture was perfect—-firm enough to hold a shape, yet soft and creamy as pudding. The edges were smooth as marble. I’d originally imagined the pepper sprinkled throughout, and I was disappointed they had settled down instead. But on second glance, I liked the way it looked—-pure white with black flecks crowning the top, like caviar, gently trickling down. And the berries. Glossy, sweet, and superbly robust. The color contrast was gorgeous. I didn’t regret stirring them into the red wine reduction, even though I usually like to eat delicious fruit as-is. I’ll save that simple happiness for the next time I’m home. So I’m officially a college sophomore. Could my freshman year have gone by any faster? After classes ended, I headed up to Maine to spend a week with my boyfriend I- and his family in the pine tree state. My last trip was full of snow and bluster, but this time, sunlight broke through the morning fog and the coastline couldn’t be bluer. Maine is beautiful in the spring – all crabapple blossoms and forsythia flowers. It makes you want to grab plastic sunglasses, tumble through grassy fields, and buy fish and chips from the roadside seafood shack. The food in Maine is good. My theory is that the town is so small, your business has to be solid or people won’t come back. In the mornings I ate eggs, sunny-side up, blueberry pancakes, home fries and chewy bacon. I tried a sweet potato and carnitas burrito (mind-blowing) and a triple-decker crab BLT. For dessert, we gorged on soft-serve hot fudge sundaes. The food at I-’s home was delicious too. My first night there, I practically inhaled my dinner. It was such a comfort to eat a hot, home-cooked meal that didn’t come out of a can or a microwave. For dessert, I-’s mother gave me a spoonful of strawberry rhubarb crisp and a generous scoop of ice cream. I can count the number of times I’ve eaten rhubarb on one hand. I know it’s not an uncommon ingredient, but we don’t grow it, and my family generally passes it as overpriced in the grocery store. 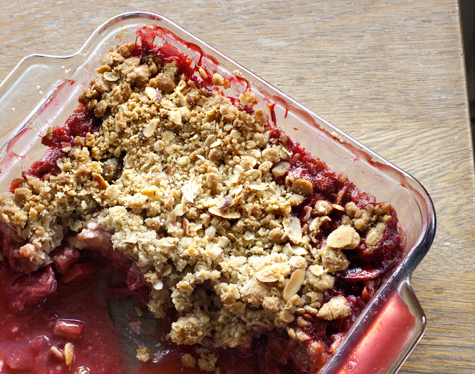 Rhubarb is a luxury for me, something that elicits oohs and ahhs. “Will you make it again with me?” I asked. I-’s family has made this crisp for years. I-’s mother pulled a card from a tightly packed box of recipes. His parents cut the recipe out of a newspaper 30 years ago – the paper is yellow and faded, and they can’t remember which paper it came from anymore. 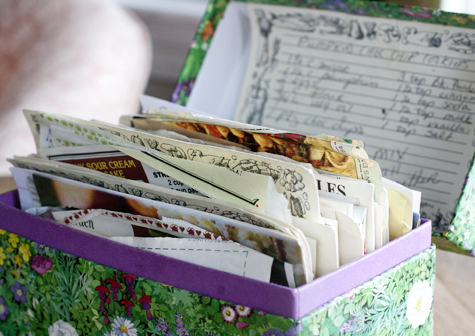 The clipping is full of cross-outs, changes and substitutions as they made the recipe their own over the years. I told them that made it officially theirs. She cut a bunch of rhubarb from the plant outside. They sat on the counter, striped red and pink and cream, billowing into dark green leaves. I couldn’t believe how vivid and thick the stalks grew. Then I tried fresh rhubarb for the first time. I bit off an end, gnawing down the fibers, and slowly chewing. It was definitely more bitter and stringy than I’d expected, but I dipped the end into sugar and discovered tangy bliss. 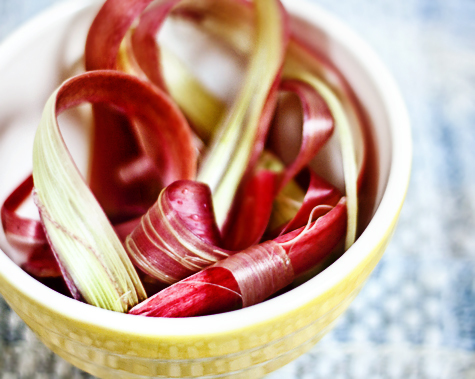 I-’s mother peeled off the rhubarb skins, like glossy ribbon on a birthday present. 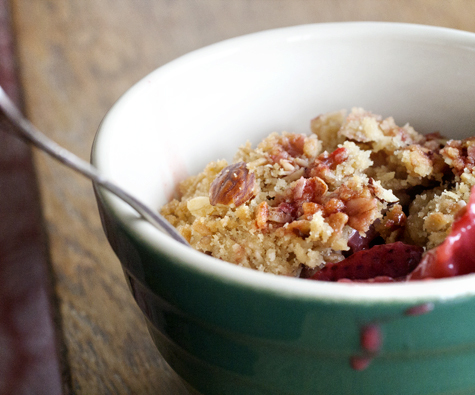 We tossed the rhubarb chunks and strawberry halves into a bowl, and let them macerate in sugar and their own juices. After dinner, I made the topping with I-’s father. He popped the butter in the microwave until it was just shy of melty. I used my fingers to rub it into the almonds, oats, and flour. 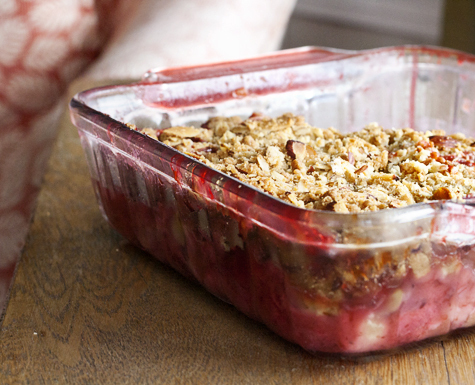 Together, we tumbled the fruit into a pan, blanketed it in crumble, and slid the dish into the warm oven. “It’s that easy!” he said, smiling at me. As the fruit bubbled and I walked up the stairs, I realized how much I’d missed family time in the kitchen. It’s not just about good food, though I ached for that too. I missed the intimacy of standing side by side at the counter, slicing potatoes and whisking salad dressing. I haven’t danced around my parents in so long, the three of us weaving among each other to grab pots and pans in our too-small kitchen. I suddenly wanted to sit at the dinner table after a long meal, listening to water run while my mother filled the dishwasher, a sleeping dog against my toes. In my year away, I’d started to forget that family is the smell of simmering beef broth, and that home is the warmth of hot oven air. I called my mom, dad, and grandma that night. As much as I loved Maine and half wanted to stay forever, deep down I also wanted to see my family. I’m home at last. I already long for the bustle of Boston. Sometimes I get bored without the rush of classes, work, and extracurriculars. I miss my friends, my roommate, and especially I-. But Seattle is sunny and even greener than I remembered. I love the familiar murmur of rain on the roof at night, the way the towering trees nestle around our house. When I came home my mother showed me around the yard, pointing out where the groundcover had spread and the plants that had burgeoned forth. She led me to the vegetable garden, dotted with slender green stems and tiny leaves. I saw the apple trees, lush and fragrant with blossoms – I can’t wait to see the branches bowed over with ripe fruit. But most hopeful of all? Our strawberry plants, which have seriously flourished, carpeting the entire ground. They make me crave rhubarb. I’ve wanted to be a journalist ever since the 9th grade. My reasons then were few but passionate – I wanted to use the written word to uncover the truth, to change my community, to travel and inspire and burgeon forth with knowledge. My sense of direction grew stronger with every internship and workshop. When I left Seattle for Boston, I left as a journalism major. But ever since I got here, I’ve been tainted with doubt. I ignored it for months and tried to enjoy my journalism classes. They sent me into the city for man-on-the-street interviews and to city hall for public records. I learned how to use cameras and microphones to record audio and video packages. And though I’ve loved hearing my voice on the radio and coming up with stories, I don’t like where I’m headed. The reality I have to face is this – I don’t like hard news. Sifting through police reports, breaking essential details into short graphs, learning the broadcast aspects of journalism necessary to survive today’s newsroom… This isn’t for me. But when you’ve been so sure of your path for so long, the thought of starting fresh terrifies. I walked out of his office shaking. Daunted by the work that changing my major conjured. Scared of making the wrong choice. I headed to the mailroom to pick up a package that had arrived for me, trusting my feet to take me there while my head spun. I don’t frequently receive packages, and at that moment I was unprepared for the lovely surprise that was Heidi Swanson’s (of 101 cookbooks fame) new cookbook, Super Natural Every Day. I tore off the paper as the elevator lurched, and I was already flipping through when I got to my floor. The cookbook was a relief. This was familiar, well-traveled territory, a path I’d always know was right for me. This cookbook was like breathing. I worked my way through the sections. Every page offered breathtaking photos, Heidi’s beautiful writing, and recipes that made me want to be a more wholesome eater. I was starved for cookbooks, having left my entire collection at home. This one satisfied a hunger sorely missed. The sides of the book became frilly with scraps of paper, marking the recipes I wanted to try first. I couldn’t bear to dog-ear the corners. 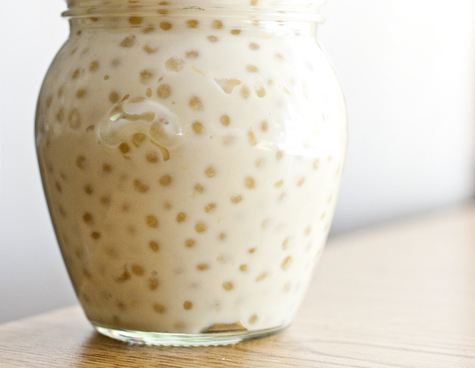 I settled on Heidi’s Honey & Rose Water Tapioca, and walked to the store. I made the pudding using the stovetop in the common room. 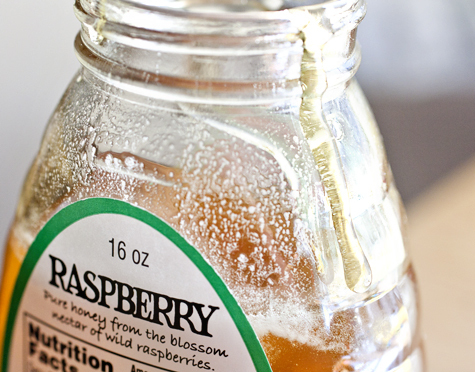 I left out the rosewater and used raspberry blossom honey, but otherwise stuck true to Heidi’s recipe. 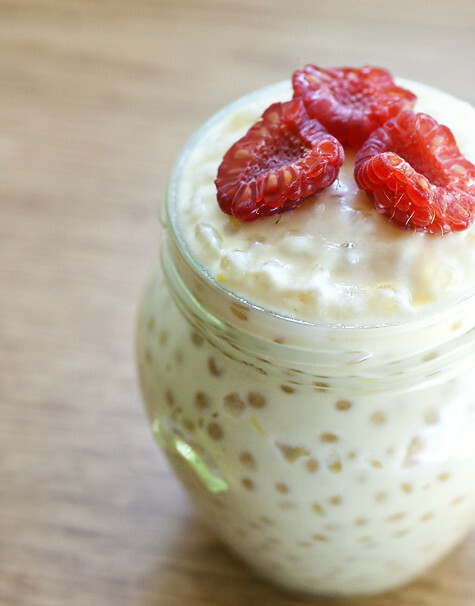 Everything about this all-milk, honey-sweetened dessert comforted. While the common room emptied bags of Fritos and put on a movie, I stirred constellations of tapioca pearls. The custard slowly thickened and the pearls grew plump and opaque. Sometimes people asked what I was making, and the floor taste-tested with plastic spoons. As the dessert set, inspiration came. 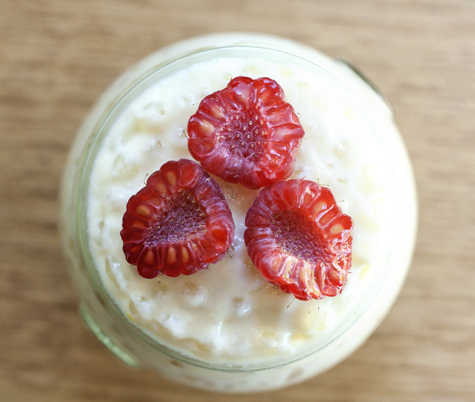 I grabbed a notebook and scrawled down the phrases that came to mind – “raspberry honey marries with a flurry of lemon zest,” “bright and wholesome,” “creamy pudding studded with chewy tapioca beads.” Writing and food are inseparable, and good food puts my pencil to paper. I smoothed the pudding into some Tupperware and looked again at the notebook. Maybe my path has always been this obvious… It just took a little trial and error to figure it out. The paperwork is official. When people ask what I’m studying, I don’t hesitate to say, “I’m a writing major with a minor in journalism.” And I swell with joy every time. Maybe somewhere down the road, I’ll try to design my own major. I’ll combine elements of print journalism with writing and publishing and some solid English literature. It isn’t completely clear yet, but I have faith in myself. For now, I’ll enjoy my summer, spend a sleepless semester in Europe, and continue to write and eat. [PS: I also have some incredible news to share! I’ve been invited to speak at BlogHer Food ’11, on a panel with my Kitchen Generation co-founders about food blogging and the younger crowd. I’ll finally get to meet my fellow teen food bloggers in person after a year of Skype chats. I’ll get to meet scores of food bloggers I truly admire. I almost can’t contain myself.